Healthy Food Choices—Understand your senior family member’s dietary needs, restrictions, likes and dislikes. Be open to trying new recipes and starting new, healthier food traditions that will benefit everyone in the family, including your senior loved ones. Stay Hydrated—In the holiday rush, it can be easy to forget to drink enough water. But dehydration can weaken the immune system, cause problems with medications and cause other serious health issues. Make sure everyone, especially your senior loved ones, has a full water bottle with them wherever they’re going and that they’re sipping enough. Drink Responsibly—Alcoholic beverages often interfere with medications seniors may be taking, so introduce healthier, non-alcoholic, yet fun beverage recipes to your family gatherings this year. Pass the Baton—Many hands make the work light; just remember that your senior loved ones may not have as much energy as they used to. 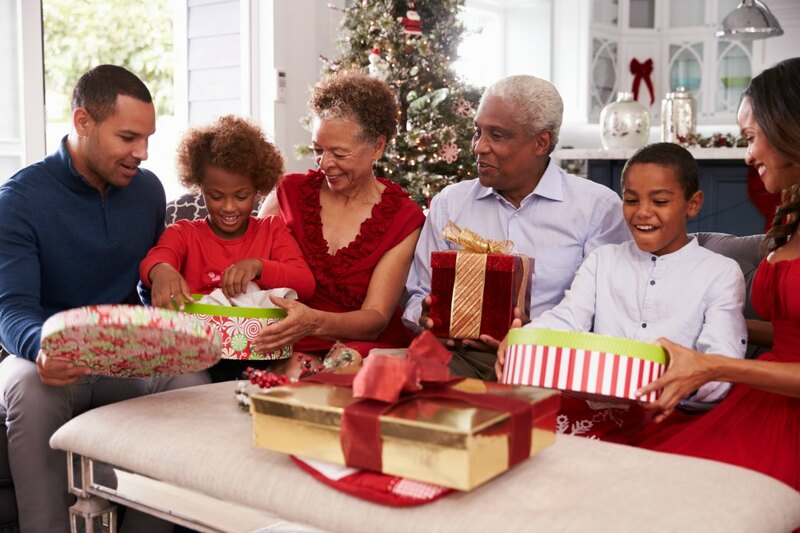 So if your senior relatives have been the organizing anchor for family holiday celebrations past, encourage them to take a more advisory role this year while the younger generation shoulders the hosting, organizing and clean-up duty. Make Celebrations Accessible—If you have a senior loved one coming to stay for the holidays, make it as easy as possible for him or her to navigate: Let them stay in a first-floor room close to the bathroom. Put nightlights around for easy evening navigation. Reduce tripping hazards from area rugs, stray toys, cords, etc. Provide Rest Breaks—Your senior loved one may require more rest than he or she has in the past; provide a quiet, comfortable area for your family member to take a catnap or escape the noise and stress when they need to. Reduce Spending—Seniors are often struggling to live on a fixed income and can feel bad that they cannot afford gifts for their family members. Start a new tradition where everyone draws a name out of the hat and focuses on just one person for the gifts so the expenditures are not overwhelming for anybody. Maintain the Exercise Schedule—Seniors and everybody else should make sure they are sticking to their regular exercise schedule. This will keep everyone healthier and more energetic through the holidays. For more individualized advice to keep your senior loved ones healthy this holiday season, contact At Home Personal Care today at (703) 330-2323; we are always happy to help!